Piqua’s Qurri Tucker drives to the basket against Tippecanoe’s Peter Guevara Friday night. Piqua’s Riley Hill scores as Mick Karn (11) screens a Tippecanoe defender. Tippecanoe’s Ben Sauls shoots over Piqua’s Kameron Darner Friday night. 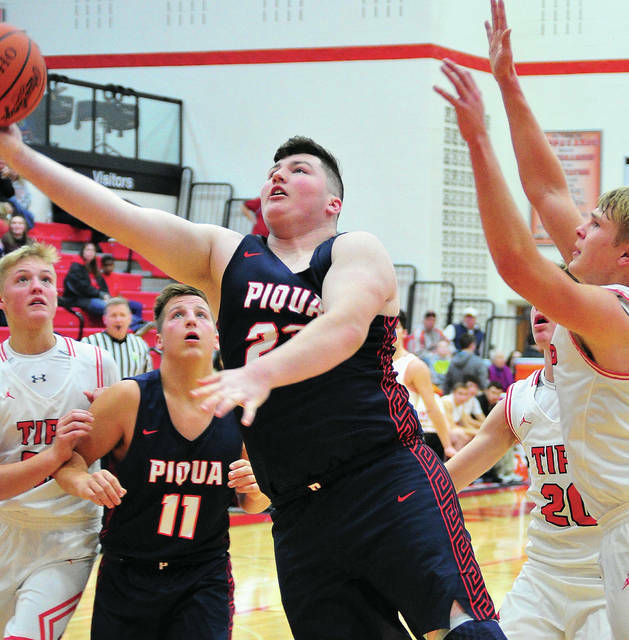 TIPP CITY — The Piqua and Tippecanoe boys basketball teams entered Friday night’s game looking to get in the win column for the first time. And thanks to a big third quarter from Ben Sauls, the Red Devils did exactly that in a 62-55 win over the Indians. Tippecanoe improved to 1-2 overall and 1-1 in the GWOC American play with the win, while Piqua dropped to 0-3 overall and 0-2 in GWOC American play with the win. Piqua had taken a 30-28 lead at at halftime. 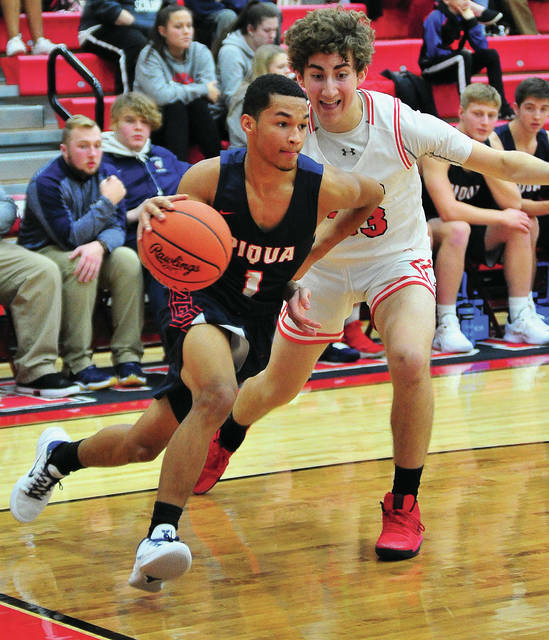 But, the Indians turned the ball over six times in the first four minutes of the second half and Sauls would scored 18 of his game-high 24 points in the third quarter as Tipp took control and Piqua could never get within striking distance in the final eight minutes. Sauls was seven of nine from the floor in the third quarter, including a desperation three-quarter shot he missed at the end of the quarter. Three of the seven field goals were from long range as he frustrated the Piqua defense the entire quarter. 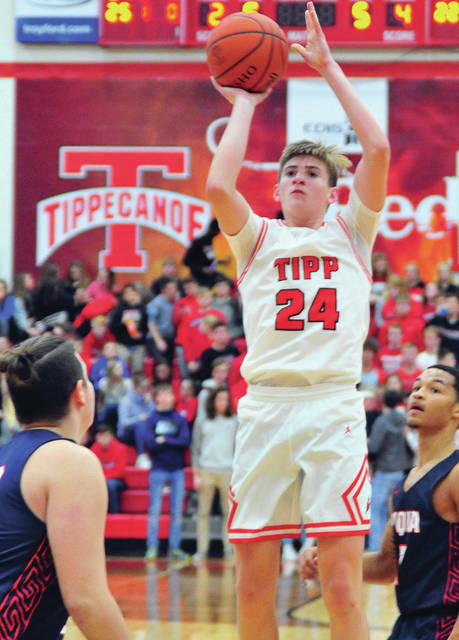 Tipp came out of the break by scoring the first six points to take a 34-30 lead and the Red Devils never trailed again. Nolan Mader hit two free throws to tie the game at 30, then Sauls hit two baskets, missing a chance for a 3-point play on the second one. Riley Hill hit a three to get Piqua within 34-33, but that was as close as Piqua could get. After a free throw by Ben Knostman, Sauls hit a three to make it 38-33. Trey Richmond scored for Piqua, but Saults hit two more threes, with a basket by Josh Riffell sandwiched in between to make it 46-35. Riley Hill hit another three but Piqua still trailed 51-44 after three quarters and could never catch up. The game had started with Piqua taking a 6-0 lead. Richmond scored off a Mick Karn assist to start the scoring. After a basket by Karn, Richmond scored again. But, Tipp used its 3-point shooting to quickly recover. 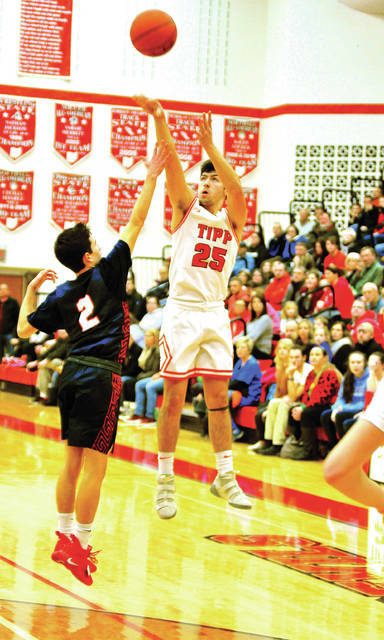 Zach Frederick and Mader had back-to-back threes to give Tipp a 10-9 lead and the Red Devils would hit four shots from long range in the opening quarter. After Patrick Manes three gave Tipp and 18-15 lead, Piqua’s Iverson Ventura answered at the first quarter buzzer to tie the game at 18. Hill hit a three to start the second quarter and put Piqua up 21-18 and it was back-and-forth the rest of the quarter. Mader gave Tipp a 28-26 lead late in the quarter, but baskets by Qurri Tucker and Richmond gave Piqua a 30-28 lead at the break, setting up a big third quarter by Sauls. Mader added 13 points and seven rebounds to Tipp’s cause, while Sauls pulled down six rebounds to go with his big game offensively. Knostman scored eight points and Johny Baileys pulled down five rebounds. Richmond had a big game for Piqua, with 14 points and 15 rebounds. Tucker scored 12 points and Hill and Ventura both scored 10. Tippecanoe was 23 of 44 from the floor for 52 percent, but just nine of 22 from the line for 41 percent. Piqua was 21 of 46 from the floor for 46 percent and just eight of 16 from the line for 50 percent. Piqua won the battle of the boards 27-20, but had 26 turnovers to Tipp’s 25. Qurri Tucker 4-3-12, Kameron Darner 0-3-3, Trey Richmond 7-0-14, Mick Karn 2-0-4, Riley Hill 4-0-10, Zack Lavey 0-0-0, Zach Tillman 1-0-2, Iverson Ventura 3-2-10, Garrett Schrubb 0-0-0, Makeegan Kuhn 0-0-0. Totals: 21-8-55. Noland Mader 4-4-13, Zach Frederick 2-2-7, Ben Sauls 10-1-24, Patrick Manes 1-0-3, Peter Guevera 2-0-4, Ben Knostman 3-1-8, Johny Baileys 0-1-1, Jake Rowland 0-0-0, Josh Riffell 1-0-2, Jason Stephenson 0-0-0, Nick Robbins 0-0-0. Totals: 23-9-62. 3-point field goals — Piqua: Tucker, Hill (2), Iverson (2). Tippecanoe: Mader, Frederick, Sauls (3), Manes, Knostman. Records: Piqua 0-3 (0-2), Tippecanoe 1-2 (1-1). Reserve score: Tippecanoe 43, Piqua 33.